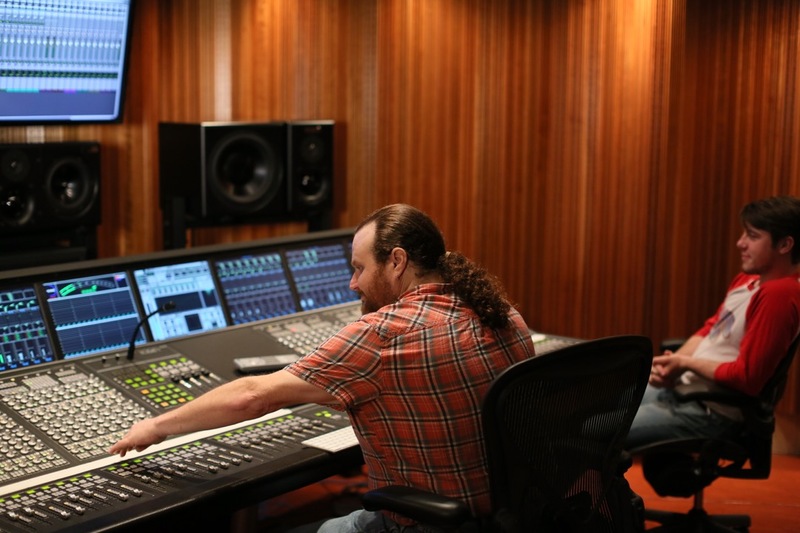 Conventional RFZ control room design is renowned for providing the best stereo imaging and the widest sweet spot, and designer Wes Lachot is renowned for creating some of the finest RFZ control rooms in the world. However, the surfaces that help to create a conventional RFZ (by steering early reflections away from the sweet spot) become a problematic source of reflections when surround speakers are added to the mix. Wes solved this problem by specifying that the hard surfaces of the conventional RFZ be replaced by highly diffusive surfaces, making the RFZ a fully diffused reflection zone (FDRZ) instead. In our design, the sweet spot is physically surrounded by a diffusion field that covers more than 80% of the engineer’s perspective. Ray-tracing analysis confirms there are no reflections either directly behind or in directly in front of any speaker position that are not diffused. 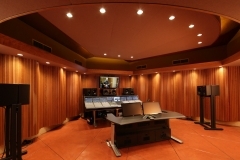 The only two hard surfaces—the STC 51 doors and the walls that contain them—reflect their acoustic energy away from the sweetspot and obliquely into the diffusors, second-order RFZ. Excited by Wes’s design, RPG Inc. stepped up and developed custom computer-optimized diffusors for the room that combine and balance high-frequency diffusion (above 2.5KHz), mid-frequency diffusion (250Hz and above), and bass trapping (250Hz and below). The specially built and tunable front and rear walls, plus a large cloud suspended six feet from a 15’ ceiling peak allow us to further optimize the room’s bass frequency response (below 100Hz). As a stand-alone facility, the Studio Annex room sets new acoustic and technical standards for surround sound design and support. 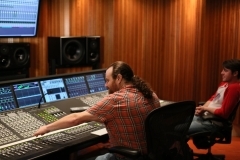 The Studio Annex offers maximum production and post-production flexibility, acting as either an extension to the Control Room or as a completely independent facility. 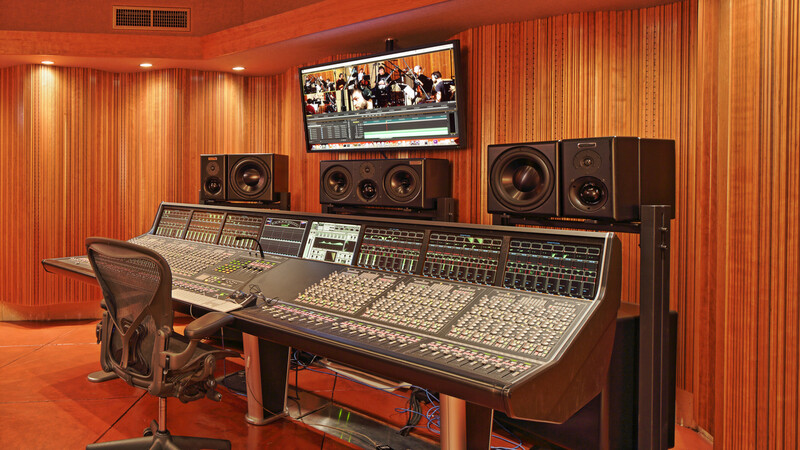 It is the perfect digital complement to our outstanding analog control room. 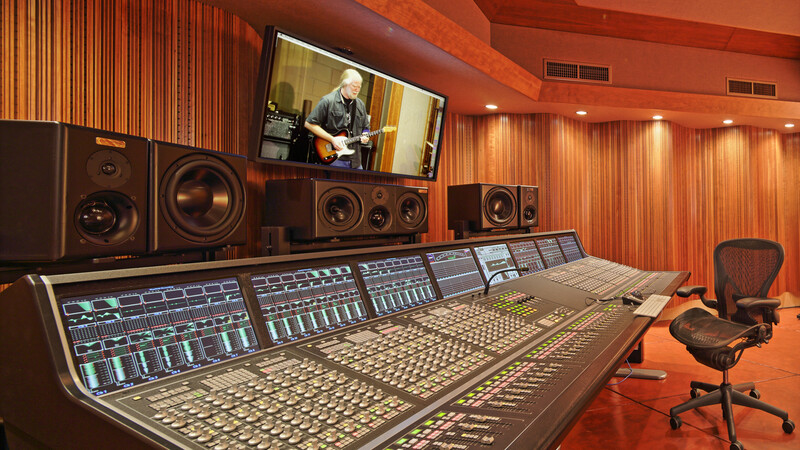 When a tracking session calls for simultaneous broadcast and/or video production, the Studio Annex can be configured to monitor and independently mix all digital signals defined in the Control Room (including analog audio signals that are converted to digital in real time). Moreover, the Studio Annex is equiped as a video control room, supporting broadcast production or non-linear editing with equal ease. By separating and optimizing the two environments in physical space, but also linking them together with a comprehensive and complete digital routing infrastructure (every signal can be routed to any point), engineers in each room can focus exclusively on the facts within their own domains, collaborating without conflict. 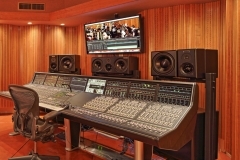 Thus, when the analog console in the Control Room is used for tracking, the digital console in the Studio Annex can be used to simultaneously develop a rough surround mix. 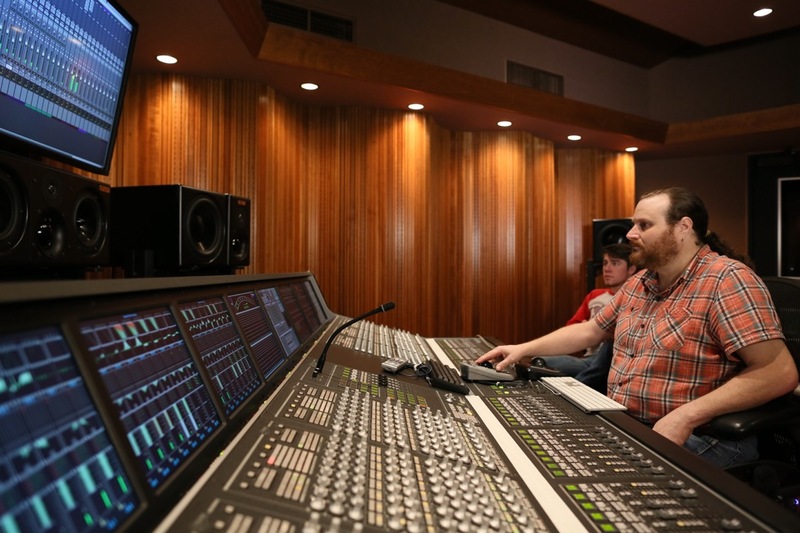 Similarly, when the digital console is used as the master device, the analog console can monitor the digital stems to validate their suitability for further mixing/remixing. And for clients who prefer instantaneous recall to analog vibe, the digital console can function as a complete tracking console. Alternatively, the two rooms can be operated independently, sharing nothing, not even clock. 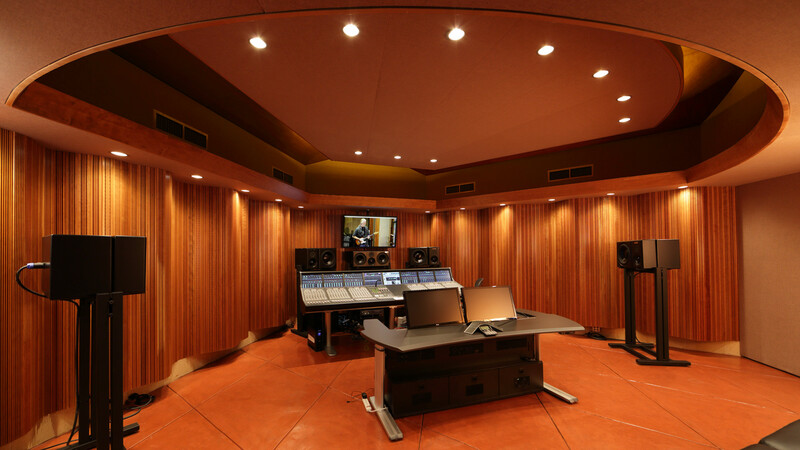 The unique acoustic design of the room, and its generous proportions, make it an interesting and intimate tracking space all its own. 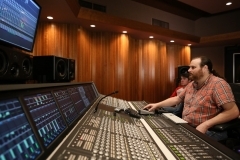 Using the same A/D converters as the Control Room, and with the option of using outboard gear matching the analog console’s tracking own signal chain (i.e., preamp, filter, EQ, compressor, and gate), signals can be recorded as if they were tracked in the other building, but without the degradation inherent with 75’ of analog cable, and video inputs and outputs in every acoustic environment assure two-way visual connections are supported. 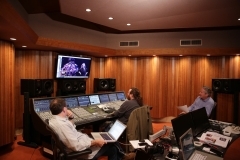 And of course, if the room is used as self-contained tracking room, the visual connection is perfect, as the engineer is in the room with the artist. 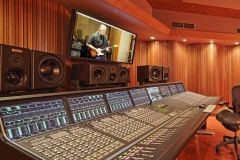 Regardless of signal and control topology, the Studio Annex offers an acoustically optimized surround environment that goes beyond conventional RFZ control rooms. And, as you can see from the images, the technical solution to this challenge is downright gorgeous. Come check it out!